Captain Jack White was born at his ancestral home at Whitehall, Broughshane in County Antrim in 1897. He was educated at an English public school and went on to Sandhurst Military College. He joined the British Army and served and was decorated in the Boer War. He resigned his commission in 1907. Although Protestant, he was pro Home Rule. Interested in the Labour movement he believed the workers should be united whatever their religions. He organised one of the first Protestant Home Rule meetings in Ballymoney in October 1913. Roger Casement was one of the speakers. 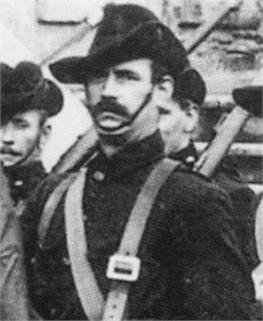 He helped create the Irish Citizen Army, a smaller forerunner of the Irish Volunteers. He was against sectarianism and hoped for a truly united Ireland with religious freedom.